This aioli was the result of a little experiment I conducted earlier this week. I was testing both my ability to make aioli and also the flavor combination. Peter over at cookblog mentioned a nasturtium pesto awhile back, and that led me down the path to nasturtium aioli. I was thinking the peppery leaves would flavor an aioli nicely. To point up the pepperiness and cut the richness with some acidity at the same time, I decided to use some slices of pickled jalapeno as well. That idea was blatantly stolen from Susan Spicer after having tried her jalapeño dressing. My concoction was just what I was hoping for in that it was thick and creamy with peppery, herbal notes and just a hint of spice. One egg yolk was whisked with garlic as the olive oil was barely dribbled in at first. Little by little, the remaining olive oil was incorporated, and then the nasturtium leaves and jalapeno were added. I tasted and added a pinch of salt. 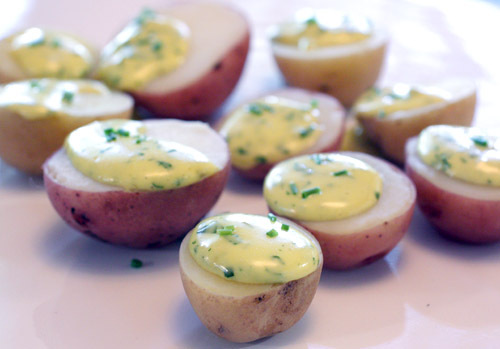 We enjoyed the experimental aioli on simply boiled potatoes. After this successful test run, I’m hoping I can recreate it and that it will pair well with roasted salmon. I'm submitting this to Ivy at Kopiaste who is hosting Weekend Herb Blogging organized by Haalo at Cook Almost Anything at Least Once. Wow, this sounds so good, I bet it went fantastically with the potatoes. This sounds like such a unique and wonderful combination with jalapeno and nasturtium leaves! Very creative! I would love to try it! this is awesome, lisa! I still have some nasturtium leaves left...i will be trying this! thanks!! Delicious sounding combination! I'm so jealous of your nasturtiums. I won't haven any from my garden for months still. I guess I should have moved further south. wow, nasturtium leaves? I feel like I've heard it all, but that's new to me. Lisa this sounds amazing. I never heard of Nasturtium before and would make a lovely entry for the Weekend Herb Blogging I am hosting, if you would like to link it with the event. Lisa this souds as music to my mouth,...haha! I know nothing about nasturtium leaves, wonder if I can find it in my surroundings. Your aioli is so unique ! i've never heard of nasturtium, but this aioli sounds delicious! Nice one Lisa...I miss growing them when I had a yard. I loved amazing the neighbor hood kids by eating them, and they had not clue you could eat flowers! This sounds so hearty! I love nasturtium leaves as a salad. I simply boil it, add salt and lemon juice. But never tried it in this way before. But couldn't find the exact meaning of aioli, could you define it please? Zerrin: Nasturtium salad sounds delicious. Aioli is a French provencal, thick sauce that is a lot like mayonnaise but includes garlic. The egg yolks and oil become emulsified, and then it can be flavored simply with salt and pepper or with saffron or lemon, or you can go in other directions as I did here. I hope you don't mind me giving some suggestions for growing..
is a very easy oneyear growing plant. you can grow it very easyly from seeds, also in pots, it grows quickly and can get over 2 meters in little time. both leaves and the colourful flowers(yellow, orange and red) are eatable. usually I just use the flowers in salad, but I will try your recipe Lisa. wow! this is lovely! It'll go with pretty a lot of different things I'll bet. with chicken or some kind of meat or just poached eggs too! Aren't you nice. In a month or two when ours are up, I'll have to steal this; when they arrive it's all I can do to keep up with them. I end up putting the flowers on everything. That sounds like a fantastic aioli! I'd love to try this! So creative - and beautiful. I've just planted my nasturtium seeds, so I'll have to wait a bit - but I'm enormously intrigued! The buttery, smooth potatoes are a nice pair for this! Great, great appetizer idea. I've had the flowers in a salad before but not leaves. 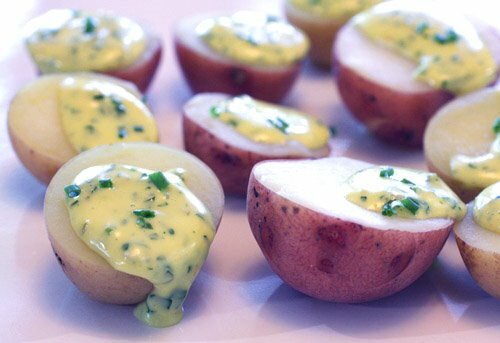 This aioli looks wonderful on those perfectly bite-sized potatoes! First and foremost, I love your blog! So does my husband. I obviously enjoy the beautiful pictures and fresh ideas as well as the fact that it isn't cluttered like most blogs. As for the nasturtium, I thought I had heard it all but am pleased to know that there are still things out there that I can discover. I too have recently started food blogging and would be delighted if you took a look at mine; http://www.foodsnobdiary.blogspot.com/. Keep up the good work! Really like the nasturtium leaves here, what a great idea. Few notes on aioli: If you have a mortar and pestle, use it to grind the garlic. Destruction of the cell walls releases chemicals that drastically change and improve the overall taste - (traditional, and my opinion). Also a touch of mustard will help emulsify the fat in the case that it is coming out a little too thin - which it doesn't look like you are having a problem with at all! Oh, a nasturtium recipe! How cool! I'll have to send this to a friend of mine who had lots of plants in her garden.